For Jenn Harper, the founder and owner of Cheekbone Beauty, it all started with a dream – literally. Launched in late 2016, Cheekbone Beauty is an online cosmetics store that produces lip gloss and liquid lipstick. It also features contouring products and highlighting kits that work for anyone, but are highly pigmented so they look especially great on Indigenous women. The company’s goal is to find new ways to source products from Indigenous producers. It also donates 10% of its profits to Cindy Blackstock’s Shannen’s Dream Foundation for the education of First Nations children. Her white mother raised Harper in the Niagara region and so she, like many white people in mainstream society, knew very little about the history of Indigenous people in Canada. It was only at 35 that she learned the horrifying truth about the residential school system, the destruction of Indigenous culture through colonization and how today the system doesn’t allow Indigenous peoples to rise up because reserves are drastically underfunded compared to neighbouring municipalities. Growing up knowing little about her culture, except for the problems she would see among her Indigenous father’s side of the family, Harper said she didn’t realize how racist some of the things people would say to her were until years later. “In my early 20s, I worked as a waitress [in Toronto] where I got a lot of ‘You don’t speak how you look’ comments. At first I didn’t get it, but then I started to realize what they meant,” explained Harper. After Toronto, Harper moved back to the Niagara region, met a man, got married, started a family and went to work in sales and marketing in the food industry. Throughout all of this, she was battling an alcohol addiction. “I never wanted to admit it because who wants to be the ‘drunk Indian’? It was that stereotype that I was fighting. But things like alcoholism and suicide are symptoms of what we now know as intergenerational trauma,” she explained. November 26, 2014, marked the turning point – the date Harper had her last drink. It was then that she began researching her own people, exploring her culture and months later had that magical dream. Harper then began her research and consultation phase into founding a business. She estimates having read about 100 books in the first year. Initially, she wanted to create a charity that used lip gloss as a fundraising tool. But financial advisors she worked with explained that starting a business is about as much work and that it would be easier to find a charity to donate to. To date, Cheekbone Beauty has donated $5000 and has greater plans down the road as Harper expands the business. So Harper morphed the concept into a cosmetics company. She said that Shannen’s Dream was the perfect fit because it addresses the inequality Indigenous children face in education and honours the contributions that one very brave teenager made before her untimely death in a car crash in 2012. “[Shannen] didn’t get to know what her campaign did. She had that ability to get up and say, ‘No, this isn’t right,’ and her simple statement, to have ‘safe and comfy schools’ like the kids in the rest of Canada have, had so much impact. Why are our First Nations, Métis and Inuit kids not getting that?” asked Harper. Harper now speaks with many non-Indigenous people in the business world. It provides her the opportunity to enlighten them about the history of residential schools and what reality is like for First Nations peoples. 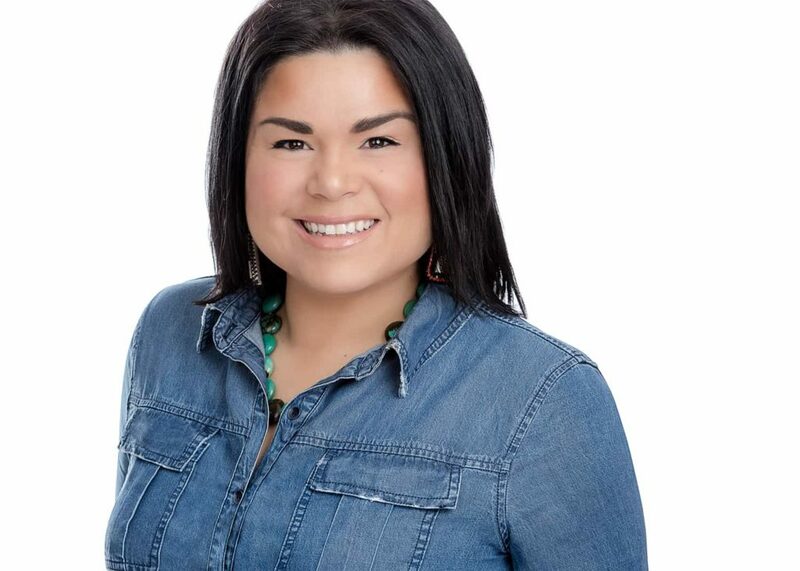 While some just don’t get it, she said that every time she speaks she gets at least 20 emails or direct messages and through this networking she is educating the non-Indigenous public. Harper said that Cheekbone Beauty’s biggest sellers are the liquid lipsticks because each are named after an Indigenous woman who has made a significant contribution to society but isn’t necessarily a celebrity. A vibrant red-orange shade is named Shannen. The point is to give Indigenous women more representation, she explained. Products for Indigenous women are not represented in the beauty industry, nor are the contributions of Indigenous women recognized. Her plan is to source the products from First Nations communities as much as possible with things like lavender from Six Nations and petroleum from Alberta. Then she will look into having everything formatted with a cosmetic scientist in order to move from into big batch production. Every aspect of this process is done, as much as possible, by employing and promoting Indigenous people, whether they are brand ambassadors on Instagram or ingredient harvesters. Harper has plans to develop other products and build a new website as soon as she moves on to the next business phase.